Just when Mia thought she had the whole princess thing under control, things get out of hand, fast. First there’s an unexpected announcement from her mother. Then Grandmère arranges a national primetime interview for the brand-new crown princess of Genovia. On top of that, intriguing, exasperating letters from a secret admirer begin to arrive. Before she even has the chance to wonder who those letters are from, Mia is swept up in a whirlwind of royal intrigue the likes of which she’s never before witnessed. 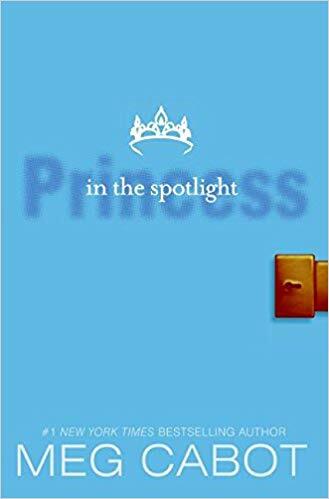 Princess in the Spotlight is the second book in the Princess Diaries series. Let me tell you it was a lot like the first and I didn’t really enjoy it. I found it funny in some spots and cute, but not my type of read. I do not think that books like these are worth reading because of all the garbage in them. I would rather read other love stories and teenage tales than this one. But that is just me. Not all books are for everyone. Even during my tween and teen years I was not a big reader of books like this. It just isn’t my type of book, which may be why I liked it even less.